Home - What garden games will you be playing this Summer? 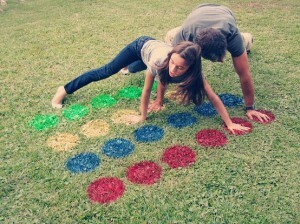 What garden games will you be playing this Summer? We are all waiting with bated breath, hoping that this Summer the British weather is going to be bright, warm and dry, enabling us all to enjoy our outside spaces and gardens this Summer. With children’s school holidays creeping ever closer and the occasional Summer party getting planned, our minds turn to how we will keep everyone entertained during these fun days. It is lovely to welcome everyone to your garden, and sometimes it’s nice to be able to entertain friends by doing something that will involve the young and the old which causes merriment, fun, laughter and a little bit of friendly rivalry. If you like to play team games such as rounders or football, try to ensure there is enough distance between the players and your delicate plants and double glazed windows, so they do not get damaged! An old garden game is Croquet. It is played on a flat lawn and involves hitting balls through a number of hoops with a long handled hammer. It sounds easy to the uninitiated player, but it is a highly technical game that is not as easy to play as first thought. The aim of the game is to get your ball through hoops around a circuit on the lawn in a specific order and direction in the quickest possible time. 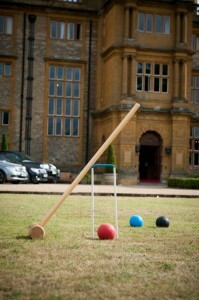 Image from Joely Thomas on Pinterest – Anyone for a game of Croquet? There are usually four players, two in each team who take it in turns to strike their ball. The black and blue balls play against the yellow and red balls. 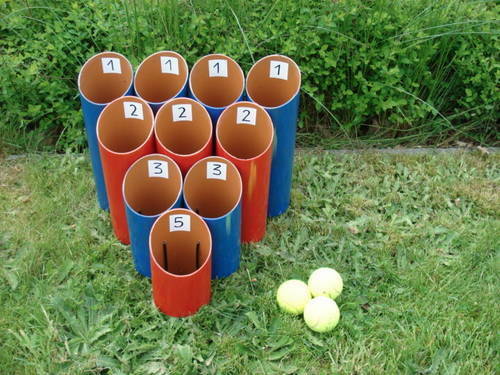 The aim of the game is for a team to get both of their balls through the 12 hoops in order and hit the peg at the end. They are then the winners. Once a ball has completed the circuit and hit the peg (is “pegged out”) it is removed from the game. With specific rules about which way your ball should go through the hoop and the direction the game should flow, I’m sure there will be a few discussions before the end of the game. If your garden is compact and not big enough for ball games or ‘hide and seek’, what other games are there that you can play? 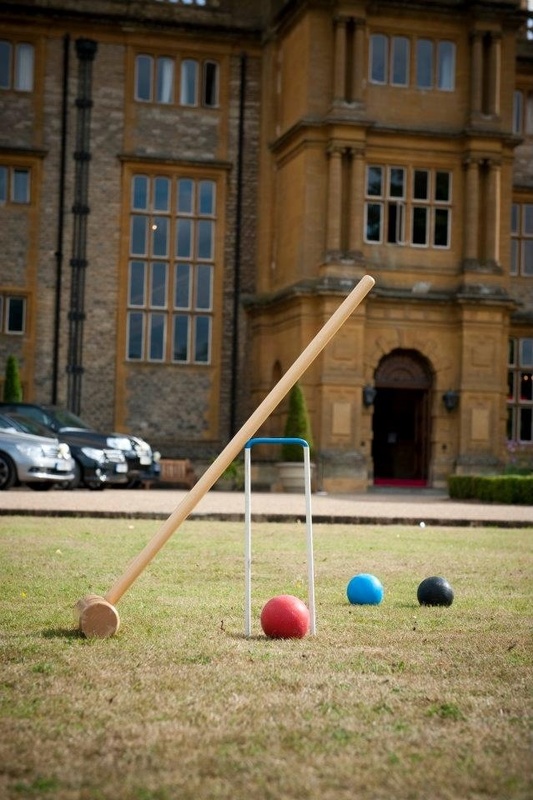 After a little investigation, I found that there was a huge array of garden games from Darts, Swing-ball, Skittles, Bowls, Giant Dominoes, Chess, Draughts, Giant Jenga, Aunt Sally, Boules, Badminton and Hoop-La and I am sure a few more that we have missed off the list. 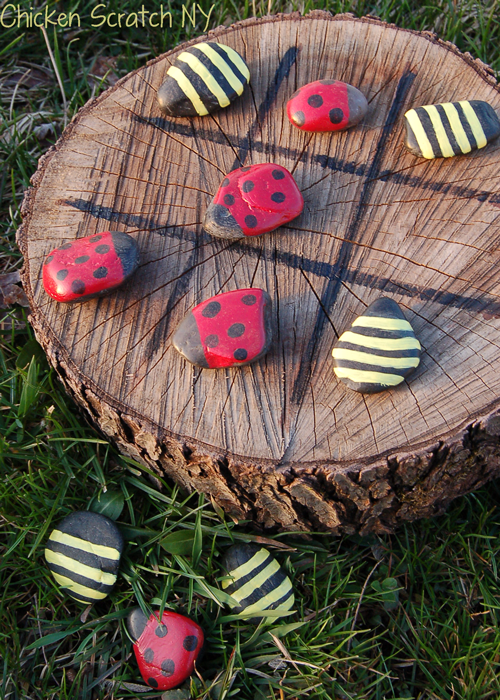 We found these two games on Pinterest the first game uses a slice of tree, marked out with hand painted stones for the Noughts and Crosses. The second game uses a water pipe cut off in different lengths, bound together and numbered for a ball game. 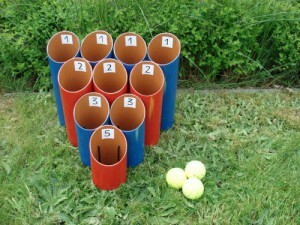 Image from Craftster.org who show you how to make the ‘Pot the Ball’ game. If you don’t want to spend any money and think it would be more fun to make your own games, why not have a look around your home and garden at what you can use? Other ideas for games are chalking out the pathway to play Hopscotch or Noughts and Crosses or using pieces of rope for the grid and stones. There is always something you can do in the garden; whether it is playing a game, gardening or bird watching it is a wonderful outdoor classroom as well as a playground. If you are interested in spotting the birds you may have in your garden why not take a look at our Infographic which will help you with their identification. We would like to know how you will spend the time in your garden this summer and what games you will play. Why not send us a picture of your garden game by pinning it to our Homemade Things on Pinterest. Enjoy your time in the garden this Summer!